When my family moved to the Floyd/Carroll county line in 1979, it was in part because my parents chose to abandon a middle-class lifestyle in North Carolina that they could have pursued in a way that achieved some people’s perceptions of “The American Dream.” My father had a good job at the Research Triangle Institute in Raleigh, NC. He left that position and everything it gave us in terms of financial and social stability and took his family to a small farmhouse with no electricity or running water—until we installed a hand pump—on the banks of Deepwater Creek out in Indian Valley. At nine years old, I learned how to operate a wood cook stove, how to wash clothes in a wringer-washer, how to carry water for a family of five (and how to conserve water for the rest of my life as a result), and how to live with the confusion and judgment of our extended family because many of them could not understand the circumstances that led my parents to make such a seemingly extreme—some would even say irresponsible—decision. After working in the sawmills and the hayfields, and a few other jobs that required hard labor and honest effort, my father was hired as the coordinator for Citizens for the Preservation of Floyd County. The struggle to keep the 765 KV power lines out of Floyd had been ongoing for a few years already and when dad got involved, most of the community was already aware that APCO planned to build these giant lines that would carry coal-powered electricity from WV to NOVA. What my father did, so far as I can recall, was to bring the community together and help to organize the resistance that was ultimately unsuccessful in keeping the lines out but remarkably successful in bringing the community together. To this day those giant power lines are, to my knowledge, the only existing energy infrastructure in Floyd County that are not related directly to Floyd County’s energy needs. Most of you probably knew my father, Wayne Bradburn, or you may know of him. Over the years he participated in the community in various ways, including a job as the small business incubator manager at the Jacksonville Center, working for the 2000 census, and a brief stint with the Ruritan Club. When I began to lead the effort to keep the Mountain Valley Pipeline out of Floyd, my father was a huge inspiration to me. Though he did what he had to do over the years to keep his family afloat, his professional decisions were never based on profit. He did not ever choose to own land, claiming that his moral and ethical position was that land is not something that can be owned by anyone, that we all have a responsibility to be stewards for the earth upon which we reside. Wayne died five years ago. It is, perhaps, unreasonable to claim that your father was also your best friend, but I truly felt that way about my dad. As a widow and a single parent, he was not only a friend and father to me; he also played a very large role in the upbringing of my daughter. It took me a very long time—and a great deal of community support—to “recover” from that loss. I’m giving you this background so that you can, perhaps, understand a little bit about why the work I have done over the last few months has been motivated by a true love for community and for the remaining authenticity of the people and the work of Floyd, in the sense that we still carry on some of that heritage. There are those who are still working horses, cooking with wood or choosing to build homes that do not conform to the “standards” that most Americans choose to live by. Most people in Floyd have a deep respect for the earth, whether they consider themselves environmentalists (a word that has some unfortunate associations) or simply people who value and intend to protect the land that they live on. Floyd also has some unusual alliances and relationships, and though there are certainly different “segments” of the community, I believe that when push comes to shove, there’s a valuable and unusual willingness to come together in support of a common goal in a way that transcends personal ideologies, lifestyles or choices. This is what I have witnessed over the last few months as the director of Citizens Preserving Floyd County. Everyone has been willing to pitch in. We’ve worked together in a manner that does not always seem possible in other communities; though I hope that perhaps it is something we are learning, as a society, to pursue. Though this country was founded on independence, our system of government, at its best, encourages inter-dependence. Though I have voted in every election possible since I was eighteen and participated in social movements of various sorts from the time I was twelve, I have never felt so much like I was truly interacting and participating in local government until now. You have all been incredible. I have felt from the beginning like everyone here was really listening, genuinely concerned, and actually committed to representing and supporting the interests of Floyd. There has been an open line of communication, a legitimate sharing of resources, and you have all challenged any cynicism I held about special interests, greed, deception or corruption. I am an admitted idealist—and though I think of myself as a practical idealist, I still recognize that my idealism has contributed to my perception of the entire situation in an as-yet-undetermined manner. For example, when I go to the Roanoke Board of Supervisors meeting this afternoon, I will approach them as allies, not as enemies. Until I know differently, I will assume that the information and perspective I have to share will be one that is valued, heard and potentially acted upon. This may or may not be true, but it is you who have given me the foundation to stand on that allows me to believe that is possible, and for that, I offer you the deepest of appreciation. You’ve gone above and beyond. Thank you. As we move beyond the initial threat of the Mountain Valley Pipeline ripping through Floyd County, many of us involved in the resistance are committed to being emissaries for the surrounding region. We have so much to share that we’ve gathered over the last few months and we’re willing to assist them in their own struggle. 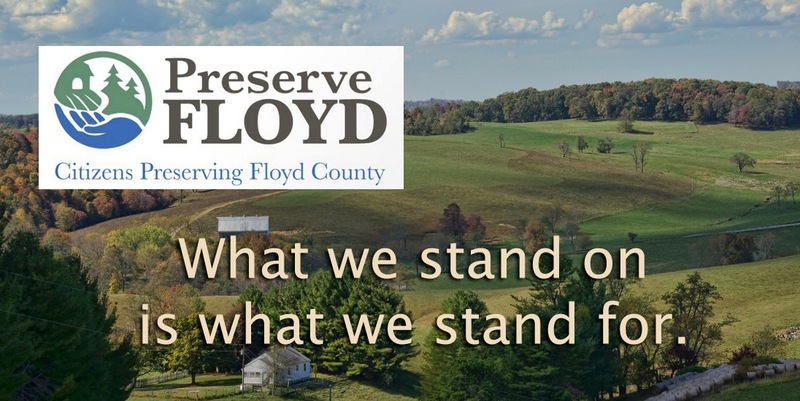 Preserve Floyd: Citizens Preserving Floyd County (PF: CPFC) has become a chapter of the Blue Ridge Environmental Defense League (BREDL) and we are working with this organization to learn how to effectively identify and address threats to our environment. What is perhaps unique about PF: CPFC is that we do not limit our definition of the environment to the ecosystem or the natural resources we have in abundance here in Floyd. We’re also considering our cultural heritage and our way of life, and looking at ways we can support and encourage that growth and preservation as environmental advocates. At this point, we have a lot of refiguring and reframing to do, and we welcome your participation in the dialogue so that we can continue to serve the community to the best of our ability. When it was announced that the pipeline would no longer be routed through Floyd, it was a bittersweet “victory” for me. What I know now about the fracking industry, the sustainability of these proposed high-pressure transport lines and the issues of injustice that surround these sorts of projects are things I cannot ever not know again. Though the proposed route does not pass over our county line, it now could potentially affect our neighbors in Bent Mountain and Montgomery County. My personal decision is to continue my efforts to ensure that EQT, an irresponsible, disrespectful and incredibly corrupt corporation, does not build this pipeline at all. But I did have a moment when I realized that we did, indeed, win. The power lines made it through despite my father’s best efforts, but the pipeline did not. And I know that he is smiling about that and patting me—and Floyd County—on the back. Because I have been the public face and the voice for this movement, I am getting a lot of credit for what’s happened. It was not me, though. It was Floyd. Hundreds of citizens who have contributed in whatever ways they could—yourselves included—and honestly, one of my biggest challenges over the past few months was to find something for everyone to do. So many, many people have offered their minds, hearts and shoulders. So many voices have been included in my public statements. It has been—and will continue to be—an honor to serve my community in this way. I hope that you will help us to determine the best manner in which Preserve Floyd: Citizens Preserving Floyd County can continue to benefit the community as we move forward. Due to the shifting circumstances here in Floyd County, Joe Waldo has decided to cancel his town hall meeting on eminent domain that was planned for next Tuesday, October 14, and move it to Montgomery or Roanoke County in the near future. We will update you as soon as we know details. Though Floyd was spared, this fracked gas pipeline is still too close for comfort. And if you are still interested in letting EQT know how you feel about their corrupt policies, their contributions to political campaigns and their dangerous and irresponsible environmental practices that have led to a 4.5 million dollar lawsuit, please feel free to show up on Tuesday for the Roanoke County Board of Supervisors Meeting at 3 PM. “In September 2014, Mountain Valley Pipeline, LLC, a joint venture partnership between affiliates of EQT Corporation and NextEra Energy, contacted Roanoke County Administration about consideration of a portion of Roanoke County for a possible corridor for a natural gas pipeline. A briefing on this matter is scheduled for the Tuesday, October 14 Board of Supervisors Meeting, 3:00 p.m., Roanoke County Administration Center, 5204 Bernard Drive. EQT will be present at this meeting. If you would like to register to speak during the public comment period, email Deborah Jacks at djacks@roanokecountyva.gov. The new route takes the Mountain Valley Pipeline through the Bent Mountain area, which is actually much closer to our friends and neighbors in Copper Hill than it was before. We must be diligent, compassionate, and support our neighboring communities in whatever way we can. Thank you for continuing to prove that community is stronger than corrupt corporations. Yes. It’s true! The proposed Mountain Valley Pipeline will NOT be routed through Floyd County. Here in Floyd, we are celebrating and breathing deep sighs of relief. So now we turn our attention to those who still need our support. Yes. Floyd wants to reach out with support and resources to Montgomery, Franklin, Roanoke, Giles, Pittsylvania, Henry, WV and any other landowners who are willing to make the drive to the Floyd Country Store tomorrow night. We will have landowner’s handbooks (you can also download them here), supportive folks who are eager to share strategies and ideas, and some tips on how you can say no to the surveying activity in the most comprehensive way possible. So join us tomorrow, Thursday, October 9th at the Floyd Country Store at 6 PM. Please enter through the side door to the left of the store. The meeting will be upstairs. This meeting is open to any and all affected landowners along the proposed route for the Mountain Valley Pipeline, and is intended specifically for those who have received letters from EQT/Coates or who’ve gotten a call from them identifying them as potentially affected by the Mountain Valley Pipeline project. We welcome affected landowners from surrounding counties to join us in Floyd. the route, establish needs specific to landowners, and ensure that everyone receives information to help them deal with this issue. Have YOU gotten a letter or a call from Coates? Hope to see you there. We will be holding a landowner’s meeting this coming Thursday, October 9th at the Floyd Country Store at 6 PM. Please enter through the side door to the left of the store. The meeting will be upstairs. This meeting is open to any and all affected landowners along the proposed route for the Mountain Valley Pipeline, and is intended specifically for those who have received letters from EQT/Coates or who’ve gotten a call from them identifying them as potentially affected by the Mountain Valley Pipeline project. We welcome affected landowners from surrounding counties to join us in Floyd if they wish. the route, establish needs specific to landowners, and ensure that everyone receives information to help them deal with this issue. The route has moved so there is likely a new group of landowners. This will also help us to prepare for the town hall meeting on October 14 at 7 PM at Floyd County High School auditorium. There will be a public presentation by Joe Waldo of Waldo & Lyle, eminent domain attorneys. This is open to all and will consist of a 45 minute presentation followed by Q&A. The Board of Supervisors will meet with EQT on Oct. 28 at 7 PM at the Floyd County High School for the public part of the supervisors’ meeting. No public questions will be allowed, so contact your supervisor to pass on your concerns and questions. Only those on the board will be able to ask questions. There is a public comment period at the beginning of the meeting and we encourage all of you to prepare a written statement if you’d like to express your concerns. Last week, the Pennsylvania Attorney General’s office filed criminal charges against EQT Corporation, a partner in the Mountain Valley Pipeline. EQT Corporation’s production division is charged with multiple counts of polluting waters and disturbance of waterways. The company allowed five million gallons of fracking chemicals to leak into Tioga County, PA, streams such as the Rock Run Class A trout stream. The leaks were discovered in May, 2012, but EQT Corporation did not take appropriate steps to clean up contamination from fracking wastewater containing barium, copper, manganese, chloride, strontium, arsenic, iron, lithium, and lead. Two years later, following demands from a coalition of environmental and business groups to take action, criminal charges have been filed by the State of Pennsylvania. We, the undersigned, are concerned citizens who urge the Federal Energy Regulatory Commission, the Environmental Protection Agency, and our federal, state, and local political leaders to act now to prevent the proposed Mountain Valley pipeline from being installed through Floyd County, Virginia. Sign and share our petition here. What we stand on is what we stand for. Spread the word. Business reporters from The Roanoke Times or other media might give greater consideration to the public’s concern and need for coverage of pipeline routing, construction and operation proposals. Landowners and localities whose property is threatened with condemnation are entitled to the objective analysis of economic benefit, compensation for taking and use of property, including protection of resources, or mitigation planning against unintended or inevitable damage. In the event a route is proposed, an objective Federal Environmental Impact Statement will be requested by communities along the route. An EIS requires that prospective impacts be understood and disclosed in advance. The EIS reports on the purpose, affected environment and range of alternatives, and analyzes the impacts of each of the alternative solutions. It also determines whether there are insurmountable impacts to threatened or endangered species, air and water quality, historic and cultural sites, and reports on social and economic impacts to local communities. And finally, the issues are laid bare with a cost analysis. There is no history of a pipeline of the Mountain Valley’s capacity crossing the full width of the Blue Ridge Mountains. Evaluation must be predicated upon the consortium’s retention of a reputable and objective firm to report upon the engineering challenges, risks and attributes of an easement route. Despite FERC’s 2002 approval of Dominion’s Greenbriar proposal, contractual obligations were not sufficient to support construction. Ironically, FERC heard criticism of that market analysis prior to rendering approval. An EIS should be subject to a period of review, rebuttal or comment by the public, who are entitled to consider information and access a reliable process of arbitration to settle any conflicting claims. Citizens have more questions than answers: How are easements valued? Does compensation to working lands accrue over the short or long term? Do pipelines pay tolls on product conveyed across private property? Do localities tax pipeline infrastructure, product, real estate, personal or business property? May the commonwealth tax revenue of an out-of-state joint venture or holding company? Who pays local taxes for land under easement? Who is liable for damages caused by construction or accident? Are pipeline owners or contractors required to post bond or other commitments to enforce contract provisions? The General Assembly enacted legislation in 2004 granting rights of entry onto private land to utilities with certain requirements. However, the voters endorsed a state constitutional amendment in 2012 changing the eminent domain process to provide landowners protection from private takings. In light of these powers, does the State Corporation Commission have a voice, or is this solely a federal process? FERC does not require a pipeline to propose local service, nor is this aspect sufficient to warrant a finding that the pipeline is in the public interest. Local distribution is not well understood; is this a profit-driven investment? Is there a break-even analysis? In the case of distribution taps serving Carroll or Pulaski County, were public funds granted or loaned to offset capital costs? Floyd County’s population does not have natural gas service, and while some suggest gas might serve an industrial or commercial customer, the cost of developing the tap is rumored to be greater than a public or private utility could amortize on economic merit. The entire population does rely upon well water; is there any comparison with economics of public water distribution? The public would be well served by research and reporting of conflicting interests, data and statements. That is the American way: State your business, present your offer and establish that you are diligent and are entitled to develop your interests without damaging others. We are counting on the media to provide substantial, informed and accurate reporting on these important issues.